Have I ever told you how much I love Tuesdays? No? I do and it is because that is the day that DVDs and Blu-Rays are sold in the stores. I am super excited for THIS Tuesday (June 10th) because that is when Jack Ryan: Shadow Recruit is released to own. "Jack Ryan": "An action hero is reborn!" (Scott Mantz, Access Hollywood) raves top critics about the "intense, exciting" (Bill Bregoli, CBS Radio News) origin story of Tom Clancy's iconic hero Jack Ryan. The thrills are non-stop as CIA recruit Ryan (Chris Pine) is caught in a dangerous web of intrigue and espionage spun between a shadowy government agent (Academy Award(R)-Winner Kevin Costner), his unsuspecting fiancee (Keira Knightly) and a fearless Russian power broker (Kenneth Branagh). Jack must quickly evolve from soldier to analyst to full-fledged operative to stop a devastating terrorist plot against the United States. The stakes have never been higher in this "taut, tense and terrific" thrill ride." I am a huge Jack Ryan fan and I am really excited to see this reboot. I have a bit of a tradition or ritual or however you want to call it when a movie comes out, ESPECIALLY when it's part of a series or regarding a particular character. I always have a movie marathon and watch all the movies in succession. I am really, really excited because I have all the previous Jack Ryan movies: The Hunt for Red October, Patriot Games, Clear and Present Danger and The Sum of All Fears and I am going to be at Walmart Tuesday to add "Jack Ryan: Shadow Recruit" to my collection and have a movie marathon complete with pizza, soda and popcorn. Oh believe me. Computer and phone will be off all weekend because I have a date with Jack. This release is extra special because it is just in time for Father's Day and Walmart has the best deal around for the Blu-Ray/DVD combo pack. From June 10 to June 14th ONLY, the Blu-Ray/DVD Combo pack (includes The Italian Job on Blu-Ray) is ONLY $12.96 exclusively at Walmart. This set will make the PERFECT Father's Day gift for any dad who loves action-packed espionage movies! Not only is this an awesome combo pack with TWO awesome movies, this also includes $15 off sports tickets at Ticketmaster. Yeah. I am not kidding!!! Two great movies and $15 off sports tickets for one low price!!! This is a deal you DON'T want to miss and it's only available at Walmart from June 10-June 14th. Pick up a set for yourself and have a movie marathon weekend and pick up ones for the fathers in your life and create an awesome gift. 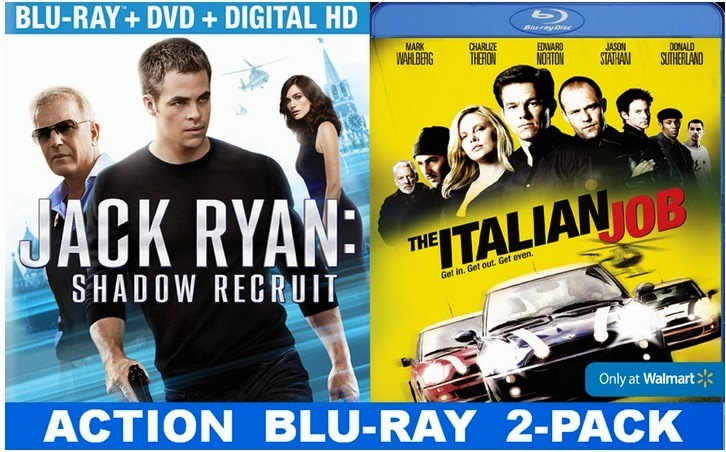 Make a special gift basket featuring Jack Ryan: Shadow Recruit plus all the Jack Ryan Movies. Add a six pack of his favorite drink and a variety of his favorite movie snacks. Cook him his favorite meal and have a movie night. Create a creative gift with his favorite sports team memorabilia along with Jack Ryan. Will you be picking up the combo set? What will you be giving the father(s) in your life for Father's Day?